Diagnosing severe dengue from those who do not develop complication is important to prevent death. 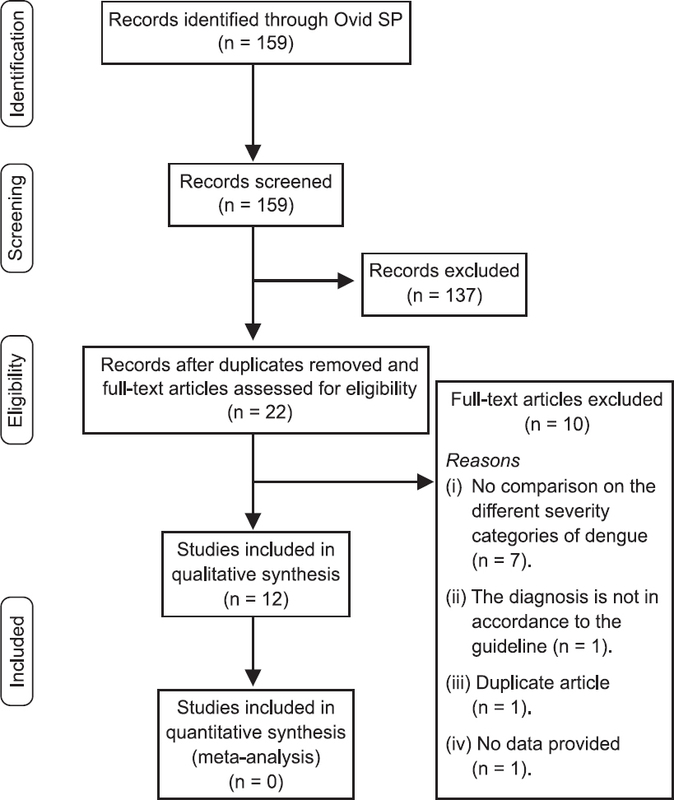 The objective of this systematic review was to evaluate the diagnostic test accuracy of ultrasonography in differentiating severe dengue from nonsevere dengue; and to assess if ultrasonography/ultrasound can be used as a predictive (screening) and diagnostic tool in the course of dengue infection. An electronic search was conducted in different databases via OvidSP platform. The included studies were cohort studies between 1995 and 2016 wherein cases were confirmed by dengue blood test. Severity of dengue was assessed and compared using standard WHO references. The methodological quality of the paper was assessed by two independent reviewers by using QUADAS-2 tool. In total 12 studies were included in this review after suitable screening. Overall, the studies included had a low and unclear risk of bias. Seven out of nine studies that compared severe dengue and nonsevere dengue, performed an ultrasonography on gallbladder (wall thickness cutoff–3 mm) with a sensitivity of 24.2–100% and a specificity of 13.2–98.7%. Other parameters such as splenic subcapsular fluid collection, pericardial fluid and hepatic subcapsular fluid collection had a specificity of >90%, though the sensitivity was poor. There were insufficient evidence that ultrasonography is able to differentiate severe dengue from nonsevere dengue accurately. The predictive and diagnostic value of ultrasonography could not be concluded due to insufficient reporting on the temporality of the ultrasonography performed with regard to the diagnosis. However, it might serve as an adjunct investigation to support the clinical diagnosis. The incidence of dengue, a mosquito-borne viral infection, has grown dramatically across the world in recent decades. It is estimated to affect 390 million individuals per year globally. An estimated 500,000 people are hospitalized each year due to severe dengue (SD), out of which, 2.5% cases die. The dengue management guideline 2009, developed by World Health Organization (WHO) was updated in year 2012, replacing the older version of 1997,. The new clinical classification has been revised into dengue without/with warning signs and SD. The aim was to provide better clinical judgment when compared to the older classification which had different grades of dengue haemorrhagic fever (DHF). Warning signs are used as hospital admission criteria. Unfortunately, the course of dengue infection is difficult to predict even with the new WHO 2009 list of warning signs, . Furthermore, the lack of specificity of warning signs has led to an increase in hospital admissions and health-care cost. A better diagnostic tool or model needs to be developed to overcome the burden of the disease and to better manage the outcome of the disease. Ultrasonography/ Ultrasound is one of the tools which have been evaluated in some studies,. Ultrasonography is non-invasive and is available in most of the emergency department and primary care centers. Handheld portable ultrasonography device has also been tested which can be applied in rural areas,. In a dengue epidemic, ultrasonography may aid in the diagnosis and serve as an adjunct investigation to clinical and laboratory tests. Findings such as thickened gallbladder wall with pericholecystic fluid, pleural effusion, and ascites strongly favour the diagnosis of dengue. Other findings that have been reported are hepatomegaly, splenomegaly and pericardial effusion,. No systematic review has been conducted to explore the efficiency of ultrasonography in differentiating the severity of dengue infection till the time of conducting this systematic review. Therefore, the objective of this study was to evaluate the diagnostic test accuracy of ultrasonography in differentiating SD from non-SD; and to assess if it can be used as a predictive (screening) and diagnostic tool in the course of dengue infection. Types of studies: Only cohort studies were included because the temporal sequence of ultrasonography performed must be clear with regard to the time of clinical diagnosis. Participants: Dengue patients of any age and gender, with or without underlying comorbidity were included. Dengue infection confirmed by NS1 antigen or/and IgM or positive viral detection via polymerase chain reaction (PCR) were considered. Index tests: An inclusion criterion was ultrasonography of the abdomen or chest. Disease conditions: Studies were compared according to the different severity of dengue infection. If the study was conducted using the WHO 1997 classification, comparison was made among classical dengue fever, the four grades of DHF and dengue shock syndrome (DSS). If, the study was conducted using WHO 2009 classification, comparison was made between dengue without or with warning signs and SD. The WHO 1997 or WHO 2009 classification of dengue severity, were used as reference standards. Biosis Previews (1995 to November 2016); Evidence-Based Medicine (EBM) Reviews—Cochrane Database of Systematic Reviews (2005 to October 12, 2016); EBM Reviews—ACP Journal Club (1991 to September 2016); EBM Reviews—Database of Abstracts of Reviews of Effects (I Quarter 2015); EBM Reviews—Cochrane Central Register of Controlled Trials (September 2016); EBM Reviews—Cochrane Methodology Register (III Quarter 2012); EBM Reviews—Health Technology Assessment (III Quarter 2016); EBM Reviews— NHS Economic Evaluation Database (I Quarter 2015); Embase (1996 to October 18, 2016); Epub ahead of print—In-process and other non-indexed citations; and Ovid MEDLINE® without revisions (1996 to October 18, 2016). Keywords used in the advanced search of OvidSP were: ‘dengue’, ‘ultrasound’, ‘ultrasonography’ and ‘USG’. Boolean operator ‘OR’ was used to combine keywords such as ‘ultrasound’, ‘ultrasonography’ and ‘USG’. This combination was then combined with ‘dengue’ by using the Boolean operator ‘AND’. Selection of studies: Titles and abstracts were screened independently by two reviewers (GKKL and MHY). ‘Independent review’ in this study was defined as blind-review performed without knowing the decision of another reviewer. Any disagreement in the selection of papers was resolved by discussion between the two reviewers. Subsequently, full texts were retrieved for the selected papers for this review. Data extraction and management: A pre-piloted data extraction form was used to extract the data. The data were extracted and cross-checked for any discrepancies by two independent reviewers (GKKL and MHY). The discrepancies were resolved by discussion between the two reviewers. The data on true positive, true negative, false positive and false negative were calculated. Assessment of methodological quality: The methodological quality of the paper included in the review was assessed by two independent reviewers (GKKL and MHY) using a modified QUADAS-2 tool. Any disagreement on the methodology was resolved by discussion between the two reviewers. The QUADAS-2 was modified by removing the question on the case-control design, since the inclusion criteria were pre-specified as only cohort studies. Each question on the QUADAS-2 was answered with yes, no or unclear for each paper. Each domain of the QUADAS-2 was summarized by stating the risk of bias with low, high or unclear risk. Any question answered within the domain with a ‘no’ was automatically deemed as ‘high’ bias risk. Statistical analysis and data synthesis: Initially, it was planned to perform meta-analysis by using hierarchical summary receiver operating characteristic (HSROC) model. However, due to the heterogeneity found in the included studies, the results generated would not be meaningful. Hence, a meta-analysis was not performed. From the data extracted, sensitivity (SENS) and specificity (SPEC) were calculated. 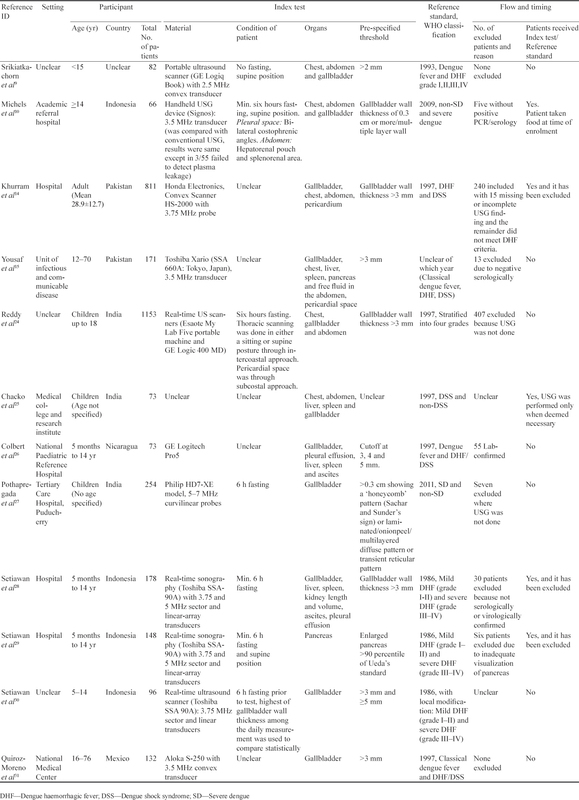 This systematic review classified studies using WHO 2009 classification of SD and non-SD. In order to allow comparison, studies which used classification other than WHO 2009, were reclassified into ‘SD’ and ‘non-SD’. The definition of ‘SD’ in this review was comparable to grade III and IV of DHF and DSS. The definition for ‘non-SD’ was equivalent to grade I and II of DHF. For one study, the comparison was made between DHF and DSS; and thus, it was assigned as ‘non-SD’ and ‘SD’, respectively. The study which classified classical dengue fever and DHF were combined to form ‘non-SD’ and DSS as ‘SD’. However, some studies compared classical dengue fever with DHF. These studies could not be reclassified because the grades of DHF were not specified. Thus, it was summarized separately in a different table. This study is registered in PROSPERO: CRD42016050490. In total, 159 studies were identified from the various databases using OvidSP platform, from which 137 studies were excluded after screening against the eligibility criteria based on the titles and abstracts, and presence of duplicates. Hence, 22 studies were subjected to full-text review. After full-text review, 10 studies were again excluded due to following reasons: (i) No comparison on the different severities of dengue, ,,,,,; (ii) the diagnosis made was not in accordance with the guideline; (iii) duplicate articles; and (iv) conclusion made without sufficient data. Finally, 12 studies were included in this systematic review [Figure 1]. Figure 1: Flow diagram of the search. The included 12 studies were published from 1995 to 2016. These studies defined children and adults with different age cutoffs. Nevertheless, the studies could be identified as either children or adults cohort. Eight studies, ,,,,,, had children as their cohort and four studies, ,,  had an adult cohort. Four studies were conducted in Indonesia, three in India, two in Pakistan and one each in Nicaragua and Mexico. In one study, the country where the research was conducted was not stated. In six studies, patients fasted for at least 6 h and in one study there was no fasting by the patients. The size of the gallbladder is affected by the intake of food and so, the patients were advised to fast for 6 h before test. This status was not clear in five studies. Out of the 12 studies, 10 studies employed WHO 1997 classification and two studies employed WHO 2009 classification [Table 1]. Risk of bias was low for most of the studies under the ‘patient selection’ and ‘flow and timing’ domains, however it was unclear for ‘index test’ and ‘reference standard’ domains. The unclear risk of bias found in index test and reference standard domains was due to non-reporting of blinding in the interpretation of index test and reference standard. A study performed by Chacko et al in the year 2008 was the only study that was deemed as high risk of bias in the flow and timing domain, because ultrasonography was performed only when it was necessary and thus, not all patients received the index test. Study by Srikiatkachorn et al was the only study that showed a low risk of bias in all domains [Table 2]. 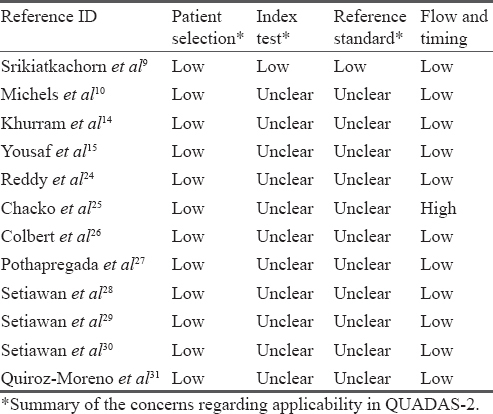 In the ‘concerns regarding applicability’ of QUADAS-2 assessment which has three domains, all the 12 studies had a low risk of bias for patient selection domain, and 11 studies had an unclear risk of bias in index test and reference standard domains [Table 2]. The only study with low risk of bias in all three domains was of Srikiatkachorn et al. Three studies that classified classical dengue fever and DHF, had a SENS ranging from 61.9–100% and SPEC ranging from 47.6–85.2%, for ultrasonography performed with gallbladder wall thickness of >3 mm indicating DHF, , . Out of these three studies, one study was conducted in patients aging >15 yr-old with 86.5% SENS and 47.6% SPEC. Two other studies that were conducted in patients <15 yr-old had slightly higher SPEC ranging from 52.3–85.2%. Only one study was performed at a cutoff of 4 mm gallbladder wall thickness on different day of illness. Two studies,  were performed with a cutoff of 5 mm gallbladder wall thickness [Table 3]. Other ultrasonography investigative parameters performed were fluid detection at the chest, hepatorenal pouch and retrovesicular pouch with a SENS of 42.9 to 61.9% and SPEC of 88.5 to 100%. There were seven out of nine studies which compared SD and non-SD, performed an ultrasonography on gallbladder wall thickness at a cutoff of 3 mm. They had a SENS of 24.2–100% and a SPEC of 13.2–98.7%. In the majority of the studies, it was not clear ‘when’ the ultrasonography was performed. 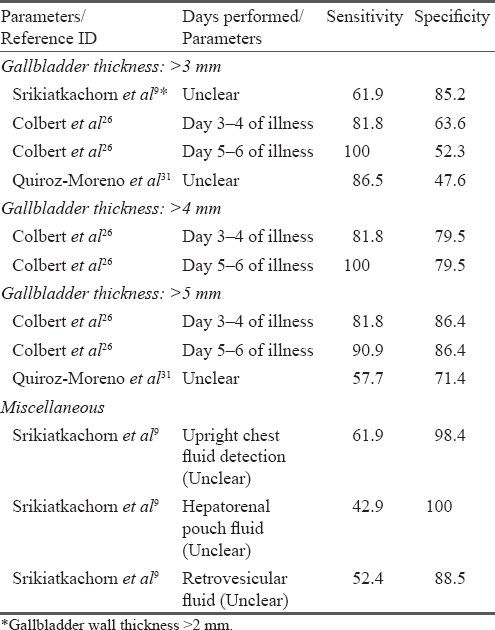 Parameters such as detection of hepatomegaly, splenomegaly, ascites, pleural effusion and pancreatic enlargement showed varying SENS and SPEC ranging from 16–100% and 29.7–94.7%, respectively [Table 4]. Other parameters such as splenic subcapsular fluid collection and pericardial fluid showed SENS of 8–66.7% and SPEC of 92.1–100%. Detection of hepatic subcapsular fluid collection showed a SENS of 13.3–50% and SPEC of 96.7–98.6%. Overall, the studies included in this review showed a low and unclear risk of bias. The unclear risk of bias was mainly due to non-reporting of whether the interpretation of index test was blinded from reference standard, or vice-versa. Only one study has a low risk of bias in all domains. Unfortunately, the results (any parameters or classification) were not optimum. All studies had either low SENS but high SPEC or high SENS but low SPEC. The low SENS or low SPEC was around 50–60% which is not ideal. This leads to too high false negative or false positive. High SENS is generally preferred because if false negative rates are high, many patients who are diagnosed with SD could be missed. A well-balanced accuracy was only observed in the study carried out by Setiawan et al with SENS of 94.7% and SPEC of 65.8–69.9% in three of the parameters evaluated: Gallbladder wall thickness of >3 mm, presence of ascites and pleural effusion. The positive predictive value was 74–76.3% (data calculated from supplementary materials). It is also not ideal because about 25% of wrongly tested positive patients will be admitted to hospital. This will incur unnecessary health care cost and resources, wastage of manpower and bed occupancy for intensive monitoring of patients. Medical practitioners might consider 25% positive predictive value useful in comparison to using warning signs as per WHO 2009 classification, because most of the warning signs were <25% of positive predictive value,. But, it is important to be cautious because the positive predictive value is affected by the incidence of SD which may be different in different population. The difference in the incidence of SD could be influenced by the occurring serotype of dengue,,. Furthermore, the study by Setiawan et al is the only study that exhibited well-balanced accuracy result among all other 11 studies. Meta-analysis was not performed due to the heterogeneity of variables in the included studies such as evaluation of different organs, use of different cutoffs and ultrasonography scanning in different days of illness. Only three studies indicated the time/duration (disease stage) of performing the scan ,,. Two out of these three studies were performed at a critical phase and around day seven of illness, . It was considered late in the whole course of dengue infection. In a study by Colbert et al the scan was performed around Day 3–4 of illness which was considered the good timing for early diagnosis. However, most studies did not report when the ultrasound was performed. It is important to have an early diagnosis even before SD is diagnosed because complications could have already occurred when SD was diagnosed. Unfortunately, Colbert et al classified their analysis into classical dengue fever and DHF which is not applicable to the current dengue practice, even though the SENS and SPEC were above 80% (gallbladder wall thickness at 5 mm cutoff). Furthermore, the positive predictive value was around 60% in which 40% of cases were due to false positives. An ideal diagnostic test accuracy should have an optimal SENS and SPEC after weighing the risk and cost of a disease. High SENS with low SPEC is suitable as a screening test while high SPEC with low SENS is suitable for a diagnostic test,. However, the disease stage/ day at which the ultrasound was performed is important to determine the temporal sequence of a test. This review could not recommend ultrasonography as screening or diagnostic test to differentiate severe and non-SD patients because most studies did not report when (disease stage/day) ultrasonography was performed. Given that three studies with SPEC >90% of ultrasonography in detecting splenic subcapsular fluid and pericardial fluid collection, it may be used as an adjunct investigation to support the clinical diagnosis, , . Hepatic subcapsular fluid collection detection may also be used an adjunct investigation when SPEC >95% as observed in two studies, . The SD which is equivalent to grade III and IV indicates initiation of shock or occurrence of shock. Unfortunately, this classification is also a heterogeneity that does not allow a suitable comparison with the current WHO 2009 classification due to the difference in their criteria to classify the categories. The limitation of this study was that only two studies applied the latest WHO 2009 classification. Of the total included studies, two,  had sample size of >800 and five studies, ,,,  had around 130–250 samples. The remaining five studies had <100 samples, , ,, . Heterogeneity in the sample size could also affect the interpretation of the results. Relatively large sample size in most studies could overestimate the results while relatively small sample size could underestimate the results. It is rather difficult to assess objectively on the patient's sample size with narrative synthesis unless meta-analysis is performed to assess the heterogeneity statistically. Meta-analysis could also be used to correct such heterogeneity either via meta-regression method or random effect model. Another limitation is that the fluid therapy or intervention might have altered the findings of ultrasonography because plasma leakage in any parts of the body is dependent on the amount of fluid intake. None of the studies accounted for this possible confounding factor. Perhaps a detailed description of the amount of fluid intake in future studies could address this issue, but it is rather cumbersome to quantify the fluid input. Future research on evaluating the ultrasonography as a predictive or diagnostic tool in SD should include serial ultrasound on a daily basis and a clear reporting on the temporal sequences of ultrasonography performed. However, there is limited evidence on which parameters to be evaluated first. Such studies should be able to address the limitation found in most included studies and possibly allow a meta-analysis to be conducted. Concluding this review, it can be stated that there is insufficient evidence that ultrasonography is able to differentiate SD from non-SD accurately as there were limited studies that could be pooled to make a conclusion. Furthermore, most studies did not achieve an optimal balance of SENS and SPEC. The predictive and diagnostic value of ultrasonography could not be concluded due to insufficient reporting on the temporality of the ultrasonography performed with regard to the diagnosis. However, it might serve as an adjunct investigation to support the clinical diagnosis. Bhatt S, Gething PW, Brady OJ, Messina JP, Farlow AW, Moyes CL, et al. The global distribution and burden of dengue. Nature 2013; 496(7446): 504-7. Dengue and severe dengue. Geneva: World Health Organization 2016. Available from: http://www.who.int/mediacentre/factsheets/fs117/en/ (Accessed on March 27, 2017). Handbook for clinical management of dengue. Geneva, Switzerland: WHO Press, World Health Organization 2012. Available from: http://www.wpro.who.int/mvp/documents/handbook_for_clinical_management_of_dengue.pdf (Accessed on February 1, 2018). Dengue haemorrhagic fever: Diagnosis, treatment, prevention and control. II edn. Geneva, Switzerland: WHO Press, World Health Organization 1997. Available from: http://www.who.int/iris/handle/10665/41988 (Accessed on February 1, 2018). Alexander N, Balmaseda A, Coelho ICB, Dimaano E, Hien TT, Hung NT, et al. Multicentre prospective study on dengue classification in four Southeast Asian and three Latin American countries. Trop Med Int Health 2011; 16(8): 936-48. Hadinegoro SR. The revised WHO dengue case classification: Does the system need to be modified? Paediatr Int Child Health 2012; 32(Suppl 1): 33-8. Oliveira RVB de, Rios LTM, Branco M dos RFC, Braga Júnior LL, Nascimento JMS, Silva GF, et al. Usefulness of ultrasonography in children with suspected dengue hemorrhagic fever: A literature review. Radiol Bras 2010; 43(6): 401-7. Dayanand K, Kavitha K, Singh A, Chiranth N. Correlation of ultrasound (USG) findings with serological tests in dengue fever. J Evid Based Med Health 2016; 3(12): 371-4. Srikiatkhachorn A, Krautrachue A, Ratanaprakarn W, Wongtapradit L, Nithipanya N, Kalayanarooj S, et al. Natural history of plasma leakage in dengue hemorrhagic fever: A serial ultrasonographic study. Pediatr Infect Dis J 2007; 26(4): 283-90. Michels M, Sumardi U, de Mast Q, Jusuf H, Puspita M, Dewi IMW, et al. The predictive diagnostic value of serial daily bedside ultrasonography for severe dengue in Indonesian adults. PLoS Negl Trop Dis 2013; 7(6): e2277. Vedaraju K, Kumar K, Vijayaraghavachari T. Role of ultrasound in the assessment of dengue fever. Int J Sci Stud 2016; 3(10): 59-62. Santhosh VR, Patil PG, Srinath MG, Kumar A, Jain A, Archana M. Sonography in the diagnosis and assessment of dengue fever. J Clin Imaging Sci 2014; 4: 14. doi: 10.4103/2156-7514.129260. Whiting P, Rutjes A, Westwood M, Mallett S, Deeks J, Reitsma J, et al. QUADAS-2: A revised tool for the quality assessment of diagnostic accuracy studies. Ann Intern Med 2011; 155(8): 529-36. Khurram M, Qayyum W, Umar M, Jawad M, Mumtaz S, Bushra KHT. Ultrasonographic pattern of plasma leak in dengue haemorrhagic fever. J Pak Med Assoc 2016; 66(3): 260-4. Yousaf KR, Atiq S, Sheikh QS, Nisar MS, Mansoor Z, Khalid S. Sonographic features of polyserositis as an adjunct to clinicopathological parameters in diagnosing and predicting the severity of dengue fever. Pak J Med Health Sci 2011; 5(1): 184-9. Thulkar S, Sharma S, Srivastava DN, Sharma SK, Berry M, Pandey RM. Sonographic findings in grade III dengue hemorrhagic fever in adults. J Clin Ultrasound 2000; 28(1): 34-7. Wu K-L, Changchien C-S, Kuo C-H, Chiu K-W, Lu S-N, Kuo C-M, et al. Early abdominal sonographic findings in patients with dengue fever. J Clin Ultrasound 2004; 32(8): 386-8. Venkata Sai PM, Dev B, Krishnan R. Role of ultrasound in dengue fever. Br J Radiol 2005; 78(929): 416-8. Asghar J, Farooq K. Radiological appearance and their significance in the management of dengue hemorrhagic fever. Pak J Med Health Sci 2011; 5(4): 685-92. Thein T, Wansaicheong G, Gan V, Dimatatac F, Go C, Lye D, et al. Ultrasound and chest X-ray in an adult patient with dengue. In: 63rd Annual Meeting of the American Society of Tropical Medicine and Hygiene (ASTMH) 2013. New Orleans, LA, USA: American Society of Tropical Medicine and Hygiene 2014; p. 91. Chandak S, Kumar A. Can radiology play a role in early diagnosis of dengue fever? N Am J Med Sci 2016; 8(2): 100-5. Sumardi U, Michels M, Alisjahbana B, Wisaksana R, Hartantri Y, Jusuf H, et al. Pocket USG device utilization (or role) on detection of severe dengue in adult patient. Crit Care Shock 2012; 15(3): 85. Gutierrez G, Gresh L, Elizondo D, Perez M, Balmaseda A, Harris E. Low serum cholesterol and gallbladder wall thickening as predictive markers for shock in dengue patients. In: 62nd Annual Meeting of the American Society of Tropical Medicine and Hygiene (ASTMH) 2012. Washington DC, USA: American Society of Tropical Medicine and Hygiene 2013; p. 89. Bharath Kumar Reddy KR, Laksmana RR, Veerappa BG, Shivananda. Ultrasonography as a tool in predicting the severity of dengue fever in children—A useful aid in a developing country. Pediatr Radiol 2013; 43(8): 971-7. Chacko B, Subramanian G. Clinical, laboratory and radiological parameters in children with dengue fever and predictive factors for dengue shock syndrome. J Trop Pediatr 2008; 54(2): 137-40. Colbert JA, Gordon A, Roxelin R, Silva S, Silva J, Rocha C, et al. Ultrasound measurement of gallbladder wall thickening as a diagnostic test and prognostic indicator for severe dengue in pediatric patients. Pediatr Infect Dis J 2007; 26(9): 850-2. Pothapregada S, Kullu P, Kamalakannan B, Thulasingam M. Is ultrasound a useful tool to predict severe dengue infection? Indian J Pediatr 2016; 83(6): 500-4. Setiawan MW, Samsi TK, Wulur H, Sugianto D, Pool TN. Dengue haemorrhagic fever: Ultrasound as an aid to predict the severity of the disease. Pediatr Radiol 1998; 28(1): 1-4. Setiawan MW, Samsi TK, Wulur H, Sugianto D, Pool TN. Epigastric pain and sonographic assessment of the pancreas in dengue hemorrhagic fever. J Clin Ultrasound 1998; 26(5): 257-9. Setiawan MW, Samsi TK, Pool TN, Sugianto D, Wulur H. Gallbladder wall thickening in dengue hemorrhagic fever: An ultrasonographic study. J Clin Ultrasound 1995; 23(6): 357-62. Quiroz-Moreno R, Méndez GF, Ovando-Rivera KM. Clinical utility of ultrasound in the identification of dengue hemorrhagic fever. Rev Med Inst Mex Seguro Soc 2006; 3: 243-8. Leo Y-S, Gan VC, Ng E-L, Hao Y, Ng L-C, Pok K-Y, et al. Utility of warning signs in guiding admission and predicting severe disease in adult dengue. BMC Infect Dis 2013; 13(1): 498. Thein T-L, Gan VC, Lye DC, Yung C-F, Leo Y-S. Utilities and limitations of the World Health Organization 2009 warning signs for adult dengue severity. PLoS Negl Trop Dis 2013; 7(1): e2023. Vicente CR, Herbinger K-H, Fröschl G, Malta Romano C, de Souza Areias Cabidelle A, Cerutti Junior C. Serotype influences on dengue severity: A cross-sectional study on 485 confirmed dengue cases in Vitória, Brazil. BMC Infect Dis 2016; 16(1): 320. Yung C-F, Lee K-S, Thein T-L, Tan L-K, Gan VC, Wong JGX, et al. Dengue serotype-specific differences in clinical manifestation, laboratory parameters and risk of severe disease in adults, Singapore. Am J Trop Med Hyg 2015; 92(5): 999-1005. Soo K-M, Khalid B, Ching S-M, Chee H-Y. Meta-analysis of dengue severity during infection by different dengue virus serotypes in primary and secondary infections. PLoS One 2016; 11 (5): e0154760. Bewick V, Cheek L, Ball J. Statistics review 13: Receiver operating characteristic curves. Crit Care 2004; 8(6): 508. Lalkhen AG, McCluskey A. Clinical tests: Sensitivity and specificity. Contin Educ Anaesth Crit Care Pain 2008; 8(6): 221-3.